...when you can take your dog? Wink is working very hard today, as you can tell. Hold all of her calls! Deadline! Wink is just one of the cutest things around. I wish I lived up in Oregon because I would offer to babysit on a daily basis. It's fun isn't it. I take my girls to work with me everyday. And Wink is camp as well...as are you my dear and that is a GREAT thing! Oh, wink qualifies for daughter! She makes everyone happy! 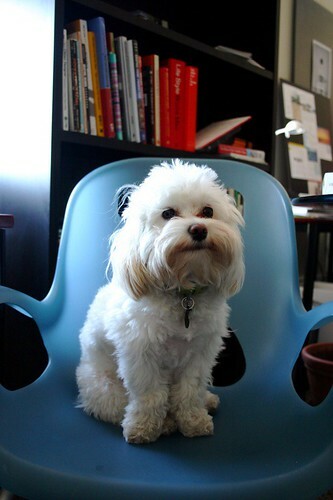 There's just not enough cuteness and happiness in the workplace, and Wink would fill the bill! She is just so darn cute.